Slip and fall accidents are the number one cause of accidents in hotels, restaurants and public buildings. According to the National Restaurant Association, slip and falls are the greatest source of liability insurance claims. Seventy percent (70%) of slip and falls occur on flat and level surfaces. According to the Center for Disease Control and Prevention (CDC), slip and fall or trip and fall accidents are the second leading cause of accidental death and disability after automobile accidents. In fact, in 2008 (the latest statistics available) “unintentional falls” were reported as the number one cause of non-fatal injuries in America’s Emergency Rooms. The National Safety Council reports that the most common injuries attributed to falls are fractures of the hip, spine and forearm. When a business acts willfully or recklessly and totally disregards the rights or safety of others they are said to be acting wantonly. In other words, wantonness is acting in a manner that you know is likely going to hurt someone. For instance, the refusal to correct or to warn people about a known hidden danger after several people have been injured may constitute wanton conduct. In certain cases, a business may be guilty of negligence and wantonness. In addition to the compensation listed above, juries may also award punitive damages. Punitive damages are not only meant to punish the business, but also to set an example to deter other businesses from acting in that same way. As with auto accidents, I have seen first hand the severe and life altering injuries that may result from slip and fall accidents. What begins as an enjoyable meal at a favored restaurant ends with a broken back. A stop at the market ends in a torn rotator cuff. A day at the mall ends with a broken collar bone. Many victims of slip and fall or trip and fall accidents believe that they can’t afford to fight for what is right because the other side will have deep pockets and can quickly outspend them. But, you don’t need a large bank account. Just an experienced attorney in your corner to fight for you. In most cases we can represent you on a “contingency” basis, which means you’ll only pay a legal fee if we make a recovery for you. If we don’t get results in your favor (through a cash settlement or a jury verdict) you don’t owe us a fee for our services. At John Ronald Spencer, P.C., there is never a charge to meet with you to determine whether you have legal rights that must be protected. The initial consultation is always free. You have nothing to lose if you make the call. But, you may lose all of your legal rights if you do nothing. 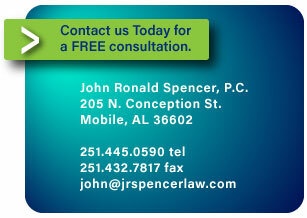 Call (251) 445-0590 today to schedule an appointment with an experienced trial attorney.